Antonio Ross Y Guell (Barcelona1873-1954) Spanish artist, designer and decorator. He studied in the School of La Lonja in his hometown with Benito Mercader and Urgelles. He exhibited regularly in the theatres and Pares Barcelona, Gaspar and Casa del Libro. His works are also shown in Madrid, Paris, Vienna, and Buenos Aires. He obtained the following awards Second medal Athens 1903, Madrid 1908 and Mexico 1910 and third in Madrid in 1910, Buenos Aires and Paris Salon, he was secretary of The Society of Catalan Artist founded in 1908. 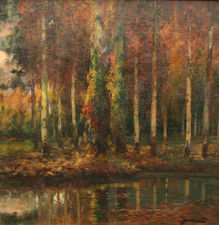 In 1903 he exhibited at the Salon pares a series of landscapes inspired by his travels along the coast Emporda, Banyoles Cadaques These works in part show a view and romance and crepuscular lighting that undoubtedly helped cement his reputation as a painter. His style reveals a debt to the art style not unrelated to the poetics of Rusinol gardens. His work is housed in many public and private collections including Government of Valladolid.